Niche automaker Morgan Motors has traveled to the Geneva Motor Show to unveil the most powerful variant of the Plus 4 convertible ever built. Under the Plus 4's long hood lies a Ford-sourced 2.0-liter four-cylinder engine that sends 154 horsepower to the rear wheels via five-speed manual transmission. The feather-light roadster sprints from zero to 62 mph in 7.3 seconds and reaches a top speed of 120 mph. Fuel economy figures were not published but the 2014 Plus 4 is expected to return noticeably better gas mileage than the outgoing model in spite of the power bump. The updates continue inside with a new instrument cluster consisting of more modern-looking gauges and a redesigned dashboard. Buyers can choose whether they want two or four seats. 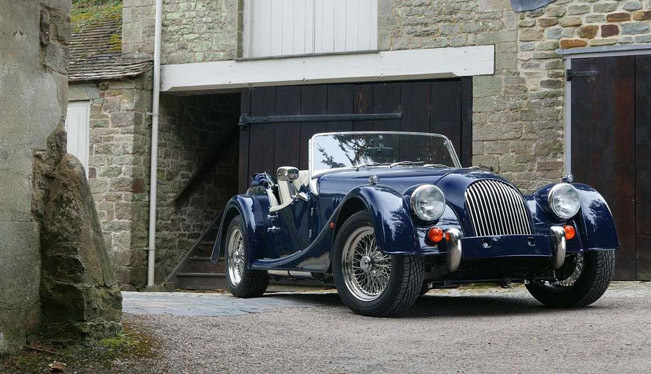 Morgan has not made any changes to the Plus 4's exterior. Essentially a copy of the original Plus 4 that debuted in 1950, the roadster stands out from nearly every other convertible on the road today thanks to a genuinely retro body accented by real chrome trim, bug-eyed headlights and wire wheels. In addition to the updated 2014 Plus 4, Morgan is showcasing the revamped 2014 3-Wheeler at the Geneva Motor Show.